The border barriers rise out of the Pacific Ocean, climb craggy California peaks, streak across Arizona desert valleys and meander through cattle ranches and fields of sorghum and citrus in South Texas. 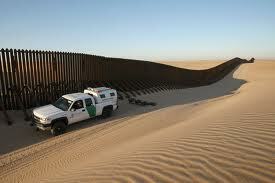 Tall steel fencing separates border communities. Camera towers and bright rows of stadium lights aim at smugglers’ enclaves in Mexico. Migrants seeking out traditional crossing routes find them blocked, and many give up.